Black belt 5th degree Rafael Carino will defend his Abu Dhabi Legends title against black belt 5th degree Alexandre Barauna. Abu Dhabi Grand Slam® Jiu-Jitsu World Tour Rio de Janeiro takes place at the Carioca Arena on 16, 17 & 18 November. Registration deadline is on 9 November. Dubai, UAE, November 05, 2018: The Abu Dhabi Legends Series will return in Rio de Janeiro at the Abu Dhabi Grand Slam®, with last year’s champion Rafael Carino to face off against Alexandre Barauna at the Carioca Arena. 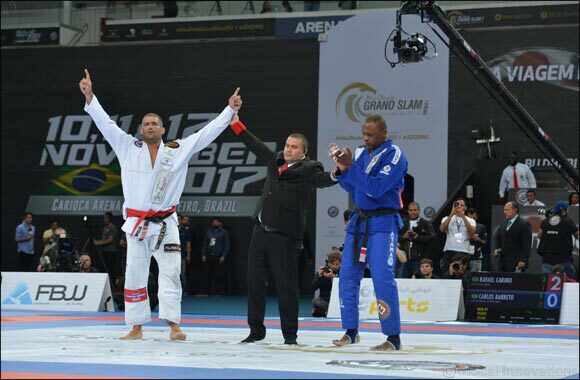 Black belt 5th degree legend of the sport and a former UFC fighter, Carino stole the show at last year’s Abu Dhabi Legends Series in Rio de Janeiro when he beat Carlão Barreto with a takedown to win the gold by a 2-0 lead. The Abu Dhabi Grand Slam® in Rio De Janeiro will begin at 10:00am until 19:00pm (Rio standard time) on 16, 17 and 18 November at the Carioca Arena. The tournament is open to all nationalities, the medalists will be listed in the UAEJJF World Ranking and cash prizes of more than $120,000 will be awarded to the top athletes of each division. The top three academies will also receive cash prizes and top ranked competitors will receive prizes at the end of the season according to the UAEJJF World Ranking. The event will be streamed live on Abu Dhabi Sports in the MENA region, Combate in Brazil and worldwide live stream on FloGrappling. The event will also be aired on delayed basis on FOX Sports in Asia, Airtel TV, Idea Movies & TV, Jio TV and Tripleplay IPTV in India, Fight Network in Canada, UK, Europe and MENA, Fight Sports in North America, Caribbean, Europe, Japan, Astro in Malaysia, Starhub in Singapore, ABS-CBN Sports in Philippines, Orange TV, IndiHome and MyRepublik in Indonesia, Singtel in Singapore and Australia, Azam Sports in Africa, EB-TV in Asia, TV Asahi in Japan, SFR Sports in France, Dubai Sports and Sharjah Sports in MENA. Fight media credentials can be picked up on Friday, 16 November from 9am at the Carioca Arena. Proper personal photo ID is required for credential pick-up.